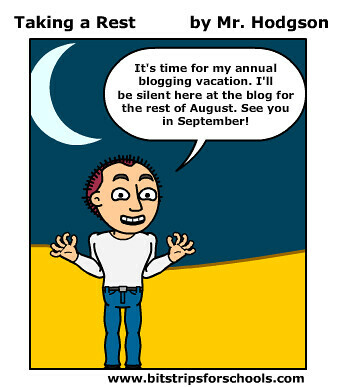 It’s the time of year when I step back from blogging for a stretch and give my mind and my blog a rest. If you are a regular reader, thank you for coming by each day and I will be writing again when September rolls around. If you are a newcomer, welcome to my blog site and I hope you find me again in a few weeks. I’ll still be writing here and there (on Twitter, at our iAnthology, for various websites where I write reviews — although I’ll be slowing down all around there, too, in August), but not here at Kevin’s Meandering Mind. I find that stepping away from the blog makes me appreciate the act of blogging more on the return, and allows me to concentrate on other things, like my family. Everybody needs a break,have fun!